Today’s cookies were made with some dried fruit I received from NatureBox, a company that delivers “nutritionist approved” treats to your door. Fuzz and I kept stopping by their booth at BlogHer to mooch free samples, so I felt it was only fair to give them a shout out. Plus, their dried berries are excellent. For these cookies I used a mixture of dried cherries, cranberries and blueberries called Cherry Berry Bonanza, which came in a box themed “Back to School”. Along with the dried fruit, the NatureBox had four other snacks. There were corn sticks flavored with onions, tomato and green pepper; twisty shaped teriyaki rice crackers; blueberry flavored almonds and some cocoa flavored waffle crackers. We liked the corn sticks the best, but the rice crackers were a close second. The blueberry flavored almonds were “interesting”, while the cocoa waffles? Well, they were not for us. But it was fun sampling everything, and discovering new snacks is what NatureBox is all about. As far as “of the month” type clubs go, this is a good one for a couple of reasons. First, it’s fun. You’ll enjoy getting a box every month for a 3, 6 or 12 month period — whatever you choose. But it’s also the perfect gift item since its emphasis is on healthy fun. You could buy it for anyone or give it to a whole family. So bookmark it for gift giving season! 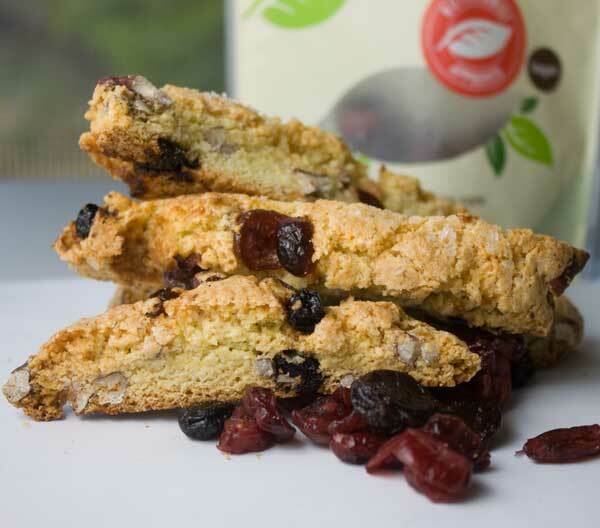 in the meantime, here’s the biscotti recipe. You can use it with whatever blend of dried fruit you have on hand, or if you’re lucky enough to get some Cherry Berry Bonanza, use that. Preheat the oven to 375 degrees F. Line a large baking sheet with parchment paper. In a mixing bowl, thoroughly stir together the flour, baking powder, salt and sugar. Add the nuts. In a second bowl, whisk the eggs. Add the almond extract and the oil. Add the egg mixture to the flour mixture and stir until everything comes together. Add the berries, then turn onto a clean surface and use your hands to shape it into a cohesive dough. It will be very crumbly, but it should come together. Divide in half and shape dough into slabs directly on the baking sheet. The slabs should be about 1 inch thick, 6 inches long and 3 inches across. Bake the slabs for 25 minutes. Let cool for about 5 minutes, then transfer to a cutting board and slice each slab into 12 3/4 inch wedges. Arrange the wedges of biscotti back on the baking sheet and bake at 300 F for about 22 minutes. Let cool completely. These biscotti look delicious. 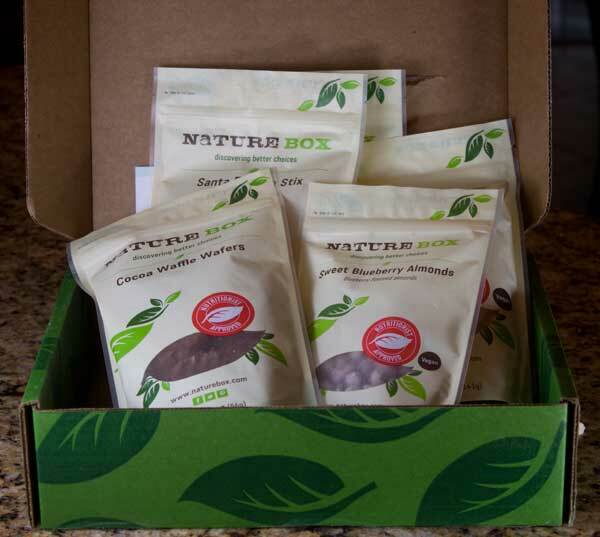 Love the idea of healthy gift giving so will definitely check out Nature Box! Thanks, Anna. I have been wanting biscotti lately but have been too busy to make any. Your biscotti look really good. I’ll check out the Nature Box website. Good idea for gift giving for people far away!